The free version of Pixelated has been updated to version 2.5. This new version improves navigation using the trackpad, and adds support for the BlackBerry PlayBook. Pixelated is an addicting puzzle based strategy game that requires a mixture of skill and luck in order to accomplish. The object of the game is to change the colour of the squares until the entire screen is a single solid colour. 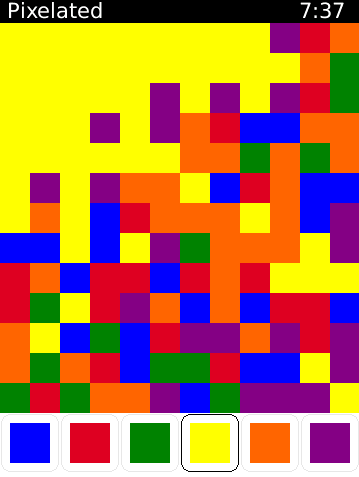 Starting with the square in the upper left corner you can change the colour of the blocks in order to match that of the surrounding squares. This is done repeatedly until the entire screen is a single colour. The object of the game is to clear the screen in as few moves as possible. Under the default settings you must do so in under 21 moves in order to win. Trackpad support has been expanded so that you can also flick up and down in order to scroll through the colour options as well as left and right. Also the BlackBerry PlayBook tablet is now supported, although there are a few issues that will be fixed soon, so it is actually recommended that you wait until version 2.6 is out before adding this game to your PlayBook. If all goes according to plan, version 2.6 of Pixelated will be out this time next week.